Social Media Websites are meant for communication and it may be personal, professional, business related. These sites help in engaging customer communication, more brand exposure and draw traffic to the websites or blogs. Several social media platforms provide an opportunity to offer quick resolution to issues. Because the customer base is typically smaller in a B2B model this can be a manageable task. 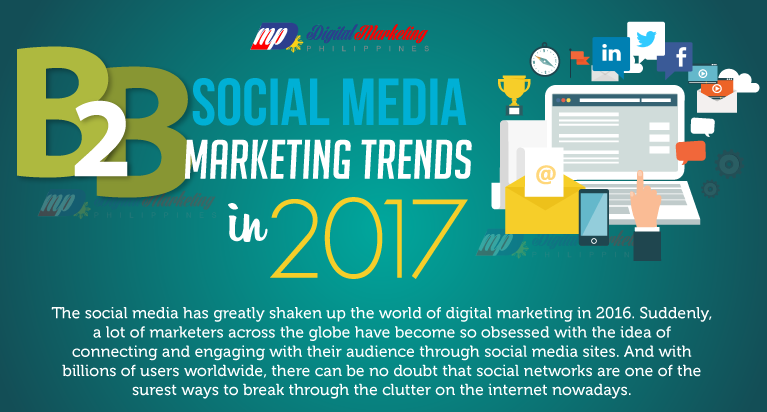 There are trends and shifts that are looming the social media marketing sphere that B2B marketers should watch out in 2017 to remain competitive in the marketplace. In this infographic, Digital Marketing Philippines will present to you the top trends that will shape the world of social media marketing landscape for B2B organizations in 2017.